Scroll down for resellers' most common questions and concerns, or go right to one of the quick links below. EDI - via Pubnet, SAN 2129442. Contact Customer Service for EDI via other methods. Net 30, no cash discounts. Buyer pays shipping, FOB York, PA. Prepayment and a completed and approved new account application are required on first orders. No terms or conditions other than these are accepted without countersignature. Available based on minimum weights or quantities. However, individual POs cannot be combined for best discount. Please contact Customer Service or your sales rep to discuss your requirements. Automatic shipments by subject areas are available. Contact the Sales Director or your Sales Rep for details. Guilford titles are available through most major wholesalers. If you are a wholesaler, please download our Information for Wholesalers. 1% of last year's net. Download a Coop Contract. Download our Agency Plan Application, or see below for discounts. Professional and Trade combine for best discount. : Single Copy Order Plan is available for all titles. Free freight for prepaid single copy orders, U.S. only. *Internet Resellers: Guilford Press does not maintain any associate programs or pay any commissions. See our Information for Websites. For stores wishing to stock titles by local authors, Guilford extends a special 33% discount on professional titles. Contact the Sales Director for details. If your store handles on-site conference and workshop sales, call Dorothy Avery, Exhibits Manager, at 800-365-7006, ext. 209, for details on our Conference Sales program. Customized flyers, bound galleys, and other promotional materials for existing and forthcoming books are available. can now be integrated into your website. This is a free way to allow visitors to search within a book to find a keyword, excerpt, or author. Follow the instructions at: http://code.google.com/apis/books/docs/preview-wizard.html. Terms for bulk and special sales depend on the quantities purchased, the type of books, and the type of reseller or purchaser. For information or to place orders, contact info@guilford.com. Retailers are expected to provide their own fulfillment to customers, but Guilford will make every attempt to accommodate reasonable requests. Drop shipping direct to customers is available for special circumstances, but not on an ongoing basis. 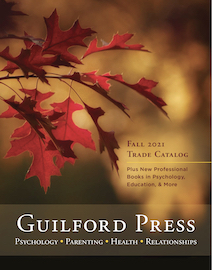 Request a print catalog of our Self-Help & General Interest titles.